New Trade inquiries again this week. The product certainly looks well and is attracting interest, however, the trade price v’s RRP remains the problem. No matter how I look at the manufacturing and purchasing costs I can see little in the way of options to reduce its costs without the huge volumes required for automated production, or a lower cost TEG module. The current work level involved in each every fan made warrant 30 minutes minimum build time, larger production batches help to an extent but we are talking a couple of minutes saved rather than 10 or 15 minutes saved. This will only come with a redesign of he main fan element to remove its assembly and replace with a pre-built component to fit. Having converted the new batch of coolers into fans – it was frustrating to find one unit was ‘faulty’ out of the box – ‘botched’ soldering -unfortunately I had dismantled the product before I realized rendering a return to supply pretty unlikely – a call for Monday I feel. That aside, the operation was trouble free and all new batches came together well. Average build time was 28 minutes for both fan sizes. A larger batch of components have been ordered and the production of these is scheduled for next week supply the following week. Stocks should cover the next two weeks based on previous average week order levels. This leaves the only real option of improving Trade margins down to increased RRP – the results of which remain to be seen. Online prices direct through www.stovetopfan.co.uk provide a very healthy return enhanced through the fact that not only to I retain the Trade discount but also being non VAT registered this 20% from the RRP. I am now considering the development of Trade Branded lines. Which I will only supply to Trade and ensure they remain unique to each market and as such let the Trade develop their own retail price – this requires a little more thought on unique features / branding without increasing my production costs – as that would rather defeat the point. As I type the UK population and several million TV viewers are building (according to media) into a frenzy of anticipation for the 2012 Olympic Games Opening Ceremony. I am unable to muster much more than feeble waft of a Union Jack flag. Switched off by the Giant Corporate Power / Brands and a true loss of the real sense of wonder at athletes of the world. Seams a while since I last updated the Blog, but then I can’t see the point in writing with nothing to include. The retail outlets have been busy, with new interest, sales, and website updates. Margins continue to be an issue and its clear that with the Trade Price offered and VAT the retail outlets have slim pickings from the Fan-C. However, the Fan-Ce is better and as this was seen as the main product for retail it is progressing well. We have taken delivery of the first batch of New coolers to convert rather than ‘pre-loved’ coolers. additionally, we now have a new batch of smaller higher output TEG modules which should combined produce an improved air flow through great power output & less losses. The whole import, customs duty & handling fees are a frustration and erode the margin. But they were built into the original costings. We are awaiting hubs for the Fan-C, and drive mount fixtures – once received we will re-order a larger batch to remove the bottle neck. No words from the Academics on the test results, and thats progress updated. We are still thinking through the key design features of the new product, I hope to have prototypes by the end of the summer and roll out should be pretty quick there after. Website hits remain consistent, a news letter out to 60 associates is hoped to bring in some further interest locally along with increased site traffic generally. 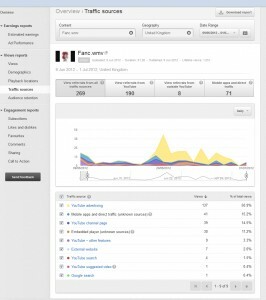 The Google Adds YouTube campaign is still running and at a low cost level send half a dozen clients to the website each day. At current levels the add fund should be good to end August. Progress has been steady, we have secured support from Nottingham University to undertake some research and development work on our behalf to enable us to develop the fan, assess its performance (RPM v’s Temp etc) and we hope to have results by the end of July. The YouTube Video hit rate continues to climb … well it can’t go down cumulatively can it ! 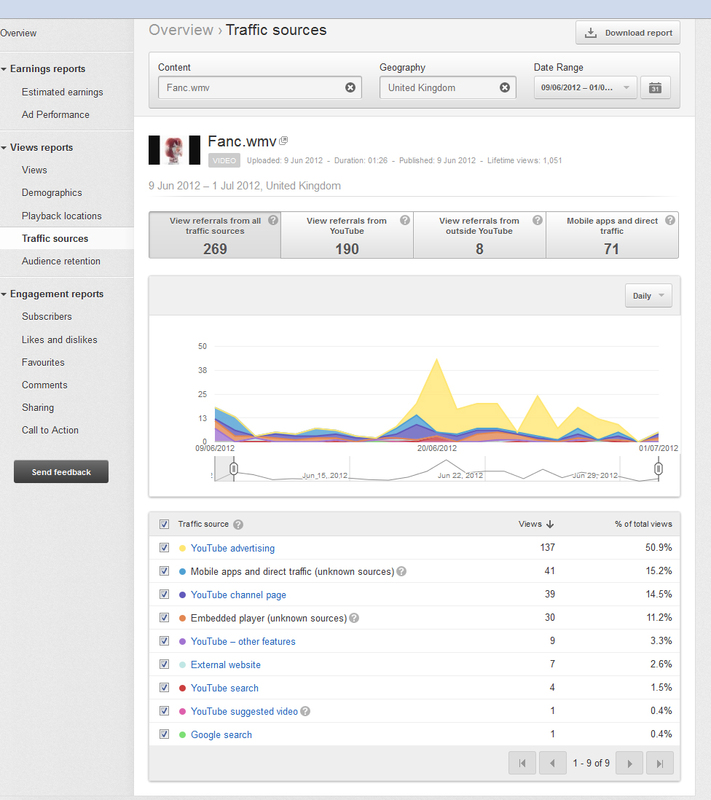 Total views to date now exceed 1280, the analytics report extract below is interesting to see the source of these views. In summary 50% of hits have come from the youtube advert and whilst this has been a paid for add, it is still running and has not yet used all the free credit allocated. Having discussed with the AddWords Team at Google – who I have to say were excellent; we modified some of the target information and Keywords for the add and this seams to have boosted views over night (not shown above as the You Tube analytics take 24hrs to update now). Has this translated into orders? Well not easy to say, the last few fans sent out were all via word of mouth from others that had come across the fan on line and as such I can not confirm if these found the fan via You tube add or a Google search. But as the current marketing and Adds seams to be costing little (£0.80 / day) and orders are coming in I have no plans to change things. As an aside I ran a Free Facebook Add for our www.peakdistrictcreations.co.uk website. When I say free we were supposed to get £50 worth of free adds on FB – the entire process is as far as I can determine far from simple and yet very similar to the Google Adds. At a budget cost of £4 per day (any lower and the add crashed ??) the Add started to gobble up the budget and produce clicks – but no direct benefits (LIKES) or apparent website follow through. After a very quick £20 – I pulled / canceled the account as the direct debits are taken each day. On investigation it appears that there were 2 similar adds running side by side so the costs was nearer to £10 per day – the direct result of the Add Set Up center crashing mid way through my setting it up – so starting again a new add was generated – it was only after checking the billing that I could determine that two adds were running – which could have resulted in each add bidding against itself and increasing the cost of placement – which is rubbish. No offer of support from Facebook unlike Google AddWords with emails and then phone call for 30 minutes on an 0800 No. We have now sent off a sample Fan-Ce to a South Manchester Outlet for assessment – I can already feel that margins will be squeezed. Sadly we have found that the stunning black versions of the Fan-Ce & Fan-C will not be available other than through www.stovetopfan.co.uk directly as special orders – as the coolers have been discontinued – meaning that only the recycled version will be available sporadicly- the website will require modification to reflect this and the July Price increase will be implemented at this time. Now its off to the workshop to check on progress in the other product areas.